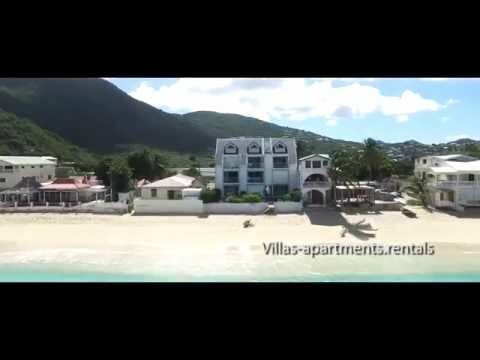 One bedroom apartment first floor up to 4 guests, Bleu Marine Residence St Maarten French Side, located on gorgeous Grand Case beach. The residence Bleu Marine propose an apartment located on the first floor of a secured and fenced building, with an elevator, and private entrance. One Bedroom apartment with queen bed, 1 bath and one convertible bed (Sleeps 2-4).800 sq-ft Sunset apartments are a high scale apartments located on the Grand Case Beach, close to many shopping boutiques, gourmet restaurants, and close to Orient Bay. The « One-Bedroom Apartment first floor up to 4 guests with a large balcony and sun lounger to enjoy the view» is directly located on the gorgeous beach of Grand Case, the gastronomic capital of the Caribbean. This apartment is in a perfect location for a family to enjoy a romantic escape right on the waterfront. Walk into Grand Case along the beach for gourmet restaurants, beach bars and nightlife. The interior is furnished and has a lounge area with flat screen TV, air-conditioning & ceiling fans. The kitchen enables you to enjoy meals at ‘home’ when you prefer just to be alone together. The dining area also has a comfortable sofa bed to relax and enjoy the stunning views. Stylishly decorated, the apartment is fully equipped and provides the best comfort to make your stay an unforgettable one. Comfortably settled on your terrace, right on the beach, you will be ableto sip a cocktail all the while admiring the sun wonderfully setting on Grand Case bay. To get something to eat, you can choose between the local « lolos », these traditional St Martin restaurants, or the gastronomic restaurants found in the village, all located within five minutes of the apartment. Outdoor Facilities: A deposit of 30% of the rental price must be paid. No contract with us will exist until we have received this amount and the booking form duly signed, and have subsequently confirmed your booking. – PAYMENT OF THE BALANCE The balance of the payment must be paid at least 60 days before arrival. If Villas-Apartments.Rentals does not receive the balance by the due date, Villas-Apartments.Rentals shall be entitled to cancel the booking, claim for cancellation charges, and to retain the deposit. For booking made within 60 days of arrival date, you will be required to pay the full cost of its rental at the time of booking.